Throughout April 2019 enter to win a Ltd. Ed. Joe Bonamassa ES-355 Standard Outfit plus a pair of Tag Heuer ‘Royal Albert Hall’-style sunglasses inspired by Joe’s favorite shades! 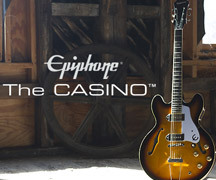 Epiphone will choose a winner from the U.S., Canada, and the UK/EU on May 1, 2019.